Mungyeong, the entrance of Youngnam and the center of Baekdudaegan Mountain Range, cherishes beautiful natural landscape(Yeongsan), various roads and a number of cultural heritages. It had been known for the second coalfield of Korea until the middle 1980s, but it has taken center stage as the city for Culture, Sports and Tourism with the development of various experiential events, and attracting “Military World Games, 2015”. In particular, a thousand years long Munkyung Traditional Tea Bowl Festival is well matched with modern well being age and traditional tea culture. So it has been recognized as the No.1 luxury brand of Korea. Regional products are Munkyung apple, shiitake mushroom, omija, Yakdol pig. Mungyeongsaejae Pass has been the No.1 road connecting Hanyang and Yeongnam for about 500 years since the era of King Taejong. At that time, there were three roads from Dongnae to Hanyang; Chupungnyeong, Mungyeongsaejae Pass and Jungnyeong. Mungyeongsaejae Pass was the shortest road. Appeared in various programs like SBS Ggurugi camera, Comedy observatory, KBS humor No.1, Show video jockey, Jinpummyeongpum, Time travel in to the history, etc. Mungyeongsaejae Pass. High and rough Mungyeongsaejae Pass, which is the most beautiful old road, welcomes tourists. It is 6.3 kilometers red clay road, and it has been recognized as the best tracking course in Korea. When you walk the dirt road along the brook, you can go back to hundreds of years ago. At any moment, you would meet classical scholars and ancient people. The former president Park Chung-hee ordered not to pave Mungyeongsaejae Pass. How would many people walked the road with various feelings? Neat dirt road looks comfortable. Mungyeongsaejae Pass has been the No.1 road connecting Hanyang and Yeongnam for about 500 years since the era of King Taejong. At that time, there were three roads from Dongnae to Hanyang; Chupungnyeong, Mungyeongsaejae Pass and Jungnyeong. Mungyeongsaejae Pass was the shortest road. But it took 15 days to cross Chupungnyeong, and 16 days to cross Jungnyeon. Classical scholars preferred Mungyeongsaejae Pass, which was the hardest road to cross. A legend says classical scholars chose Mungyeongsaejae Pass because they would fail the exam when they choose other two roads. Mungyeongsaejae Pass has three gateways. 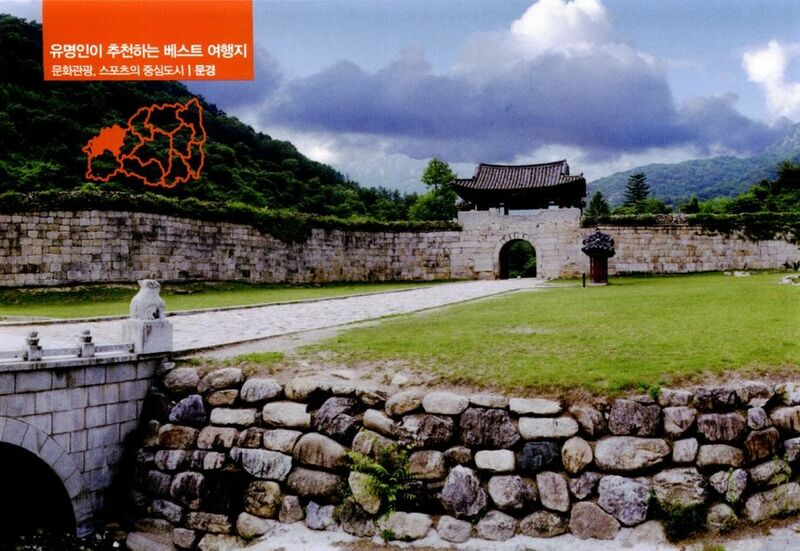 Sansungmun was built in order to protect the invasion of enemy after Japanese Invasion of Korea in 1592. Three gateways consist of Juheulghan, Jogokkwan and Joryeonggwan. I can imagine the fierce battle while passing by these gateways. Jogokkwan, the second gateway, was established in 1594, and the first and the third gateways were built in 1708, after the Manchu war of 1636. Juheulghan, the first gateway, keeps the old shape more than other gateways. When passing by the first gateway, you can see Mungyeongsaejae Pass outdoor filming site, the new tourist attraction. The Goryo dynasty filming site was changed to the Joseon dynasty filming site in 66,000 ㎡ areas. 126 buildings of the Joseon dynasty era such as Gwanghwamun Gate, Geunjeongjeon, Sajeongjeon Hall in Gyeongbokgung Palace and Gyotaejeon have been built. This filming site, which is the largest filming site in Korea, has been gotten the limelight as the folk village of the Joseon dynasty era and theme tourist attraction for shooting historical dramas. About five million tourists visit here every year. It is the historical imagination of Mungyeongsaejae Pass. Even though it is three kilometers from Juheulghan to Jogokkwan, it is good to take a walk as it has a gentle slope. From the left side, you can hear clear sound of water. You shouldn't misunderstand that Mungyeongsaejae Pass is the narrow woodland path. It was expanded to three meters when it was registered as provincial park in 1981. A variety of trees such as nut pine, schmidts birch, dogwood, oriental oak, fir and tall pine tree are growing up. 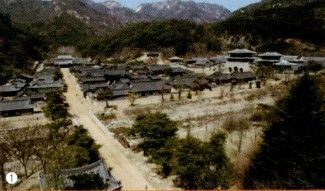 After walking about three kilometers from Juheulghan, you can see Jogokkwan in narrow valley. It is a fortress blessed with natural barriers for defense. There are few people in the road to Jogokkwan. Most people turn back from here. I am so sorry to hear that. The road from Jogokkwan to Joryeonggwan, the third road, is so peaceful. It is a desolate mountain path, but full of forest fragrance. After passing “Mungyeongsaejae Pass Arirangbi”, you can see Chaekbawi Rock where many classic scholars prayed for winning the first place in a state examination. Their wishes are always pathetic. It looks like as if it was a seonangdang(shrine to the village deity) with full of wish papers. When climbing to Joryeonggwan, the top of Mungyeongsaejae Pass, you can see Juheulsan and Joryeongsan. Cold mountain breeze would cool your head. It is Goesan, Chungcheongbuk-do beyond Joryeongsan. The road is paved. Your body and mind would enjoy the smell of soil in Mungyeongsaejae Pass. Your steps would go back again. Classic scholars of Yeongnam had to pass Mungyeong when they went to Hanyang for state exam. Their spirits are alive in every corner of the road and brick of Gomo mountain fortress. Jinnamgyoban. It is the first landscape among Kyeung-Buk eight landscapes. Yeonggang river is originated from this region. Oddly formed rocks and strangely shaped stones, and magnificent view are awesome. Gomo mountain fortress is mixed with dark blue moss and vine. Gomo mountain fortress, which is also called as Mago mountain fortress, has about 1,300 meters of circumference, 7~30 meters of height and 15~20 meters of width. It is the representative mountain fortress of the Silla dynasty period. There is Gobu castle, which makes Gomo castle look more beautiful. If Gomo castle is mother, Gobu castle is father. Two castles serve as a counterpoint to each other. There are a number of mountain fortresses in Mungyeong, because the region was the important military place. 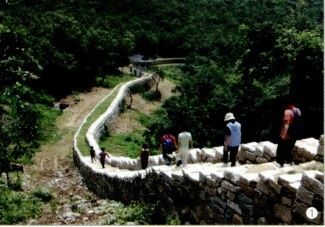 It was so steep that it protected the invasion of enemy for a day in Japanese Invasion of Korea in 1592. Due to the fierce battle, there were a lot of victims in Korean war. Tocheon nearby cherishes the old road shape. 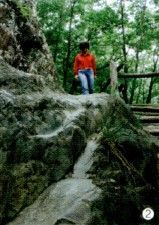 Major production sites of pottery had fine soil, good transportation and a lot of trees. Mungyeong was one of them as it had deep forest, clean water and good road. Gwanemri kiln of Mungyeong is the oldest in Korea(180 years long). Of the six pottery makers, three people stay in Mungyeong. 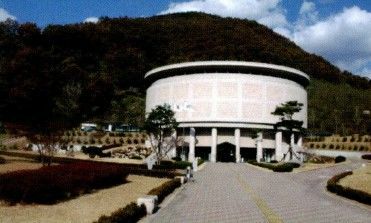 Pottery museum, which is located in the middle of Mungyeongsaejae Pass, has 11,08㎡ of land and 1,052㎡ of total floor space. 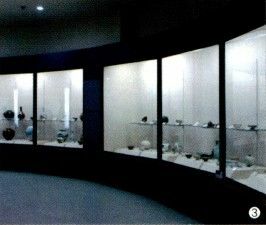 It shows the history of pottery of Mungyeong, production process, and exhibits the artworks of pottery artists in this region. You can make pottery in the exhibition hall, and bake it in Mangdaengi kiln. Mungyeong Traditional Chasabal Festival is hold in every early May in Ilwon, Mungyeongsaejae Pass. You must visit Confucian culture center, which is located nearby pottery museum. Confucian culture has been developed early in Mungyeong, since Mungyeong is located between Yeongnam and Hanyang. You can see the history of Confucianism, and the life of classic scholars of Mungyeong in the museum. You can learn the culture of classic scholars, and Gyubang culture of women in the gallery on the first floor. Their needle works and literature are awesome. The stories of classic scholars of Mungyeong and their writings are exhibited in the second floor. While Yeouido and Namiseom Island have tandem, Mungyeong has track bicycle. 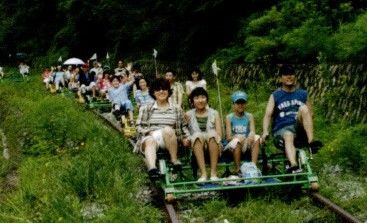 While other local governments fiercely compete to invite high-speed train driving at 300 km/h, Mungyeong made the track on abandoned train track. You can ride a super low speed bicycle on the track. It has been popular with many people. It had begun with two bicycles from the United States, but 50 bicycles were added. The bicycles have a brake, and a three-stage gearshift. A track bicycle costs four million won. It has been loved by a number of people. 55 bicycles are operated in Jinnam station, and 25 bicycles in Gauneup station. The section in service is from Jinnam station to Buljeong station or to Guryangri station. It is four kilometers to travel back and forth. And it is operated from Gauneup to Guryangri station. The charge for using a track bike is 10,000 won. Users of Mungyong Coal Museum, Gwanggwan shooting range, youth hostel or recreational forest can take 30 percent discount. You can also find attraction of Mungyeong in the clean hot springs. Spa tourist resort has been developed in 400,000 ㎡ area around Mungyeong-eup. A variety of amenities have been created. Mungyeong hot spring is a complex spa. Inside the huge bathroom for both men and women, calcium bicarbonate spa and alkalinity spa have been equipped. It has been well known that calcium bicarbonate spa is good for rheumatism, chronic dermatitis and allergy dermatitis, and alkalinity spa is good for chronic fatigue and wound repair. Besides, amenities like open-air bath, Elvan sauna, steam sauna and Ochre sauna have been built. It looks really cool to see open-air bath. Steam sauna is full of 40~50℃ hot spring steam, and it is good for obesity, fatigue recovery and neuralgia. The heat source of Mungyeong hot spring is Bulguksa temple granite that was erupted in the Mesozoic Age. It is spread out all over here, and Great Limestone Series cover it. Thermal mineral waters are yellow. Many Korean experts of hot springs say that it is better than Beppu Onsen in Japan, the world's famous hot spring. 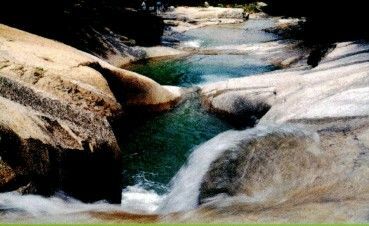 Yongchu valley is located in the boundary between Mungyeong-si, Gyeongsangbuk-do and Goesan-gun, Chungcheongbuk-do. Daeyasan mountain was made prior to Songnisan mountain, but it looks similar. Dense pine forest and oddly formed rocks and strangely shaped stones are well matched each other. Like its name, the valley has a legend related to dragon. It is so gentle that it is good to take a walk for couples and families. The valley originated from Daeyasan mountain is made of granite, so the water cannot permeate into the ground. It is popular tourist attraction in summer vacation as it has plenty of water and dense forest. While walking along the valley, you can hear the sound of flowing water, cascade and birds. The stair looks like as if it is the bare skin of woman. As it is, the mountain has a strong yin energy. Many people say it is because there is none of pavilion even though the mountain has beautiful natural landscape. Mungyong coal museum was built in Eunseong mining station(Gaeun-eup, Mungyeong-si), the last mining station of Mungyeong. You can feel the atmosphere of the mining station, and experience mine on your own. You can learn the development of coal, and the history of coal industry. And you can see the life style of Coal-mining town and mine workers. The central exhibition hall describes the creation of the Universe, the Earth, the Paleozoic era and coal chronologically. It also introduces mining works such as starting, magic vision and mining equipments. The outdoor exhibition hall is equipped with large mining equipments. It is located in the real abandoned mine area so that you can experience real atmosphere of mining station. Coal was Korea's only natural resource. It played a pivotal role for national development as the energy supplier for home, and the driving force of national basic industries. But it has been waned due to the low demand. It is the best place for young generation to remind the meaning of coal. It takes 10 minutes by 901 local road. Many tourists have visited here since the opening of SBS filming site in 2007. Huge architectures reproducing the period of the Three States are awesome. You can climb with monorail. 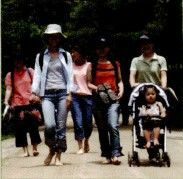 The most famous uphill path of Joseon dynasty! Mungyeongsaejae Pass is the old road of Baekdudaegan Mountain Range connecting Mungyeong, Gyeongsangbuk-do and Chungju, Chungcheongnam-do. It was the largest road from Youngnam to Hanyang. The high-ranking officials of Joseon crossed the road from Hanyang to Youngnam. Classical scholars had to pass the road to go to Hanyang. The peddlers also passed Mungyeongsaejae Pass. Old road of Mungyeongsaejae Pass, which is the national tourist attraction, vacation spot and tracking place, has kept fine dirt road. It has cherished its old shape in spite of industrialization and Saemaeul movement. Mungyeongsaejae Pass is so beautiful that it has been selected as one of “100 beautiful roads in Korea.” It is so popular that over one million tourists visit here in a year. 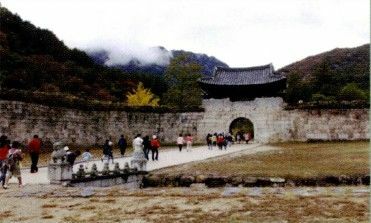 Mungyeongsaejae Pass has three gateways; Juheulgwan(the first gateway), Jogokkwan(the second gateway) and Joryeonggwan(the third gateway). These were built to protect the invasion of enemy. The tracking course passes three gateways. The first gateway is Juheulgwan. It is most colorful among three gateways. It is beautiful and huge. Soft dirt way starts from here. The road is broad enough for ten people. The road is covered with soft soil. After passing Juheulgwan, you can see Mungyeongsaejae Pass outdoor filming set. It looks similar to folk village. Old buildings like tile-roofed houses, thatched houses, Palace of Goryeo and Palace of Baekje have been rebuilt. It is one of five hugest filming sites around the world. Most Korean historical dramas have been shoot here. After getting out of the filming site, you can see Madangbawi, Joryeongwonteo and Gyogwijeong. Joryeongwon was old official residence for the government officials. There were 30 stations and 165 wons in the past. The provincial governors took office and took over tasks in Gyogwijeong.